My obsession for fool proof, quick and efficient eyeshadow sticks just keeps growing. Every time I travel or require to bring makeup to touch up after work, it's ALWAYS stick makeup. I was lucky to have met the co-founders of NudeStix, lovely Ally and Taylor. They introduced us to different uses for NudeStix and how the products are vegan and cruelty free. Today we will have a look at NudeStix Northern Lights Mini Holiday Kit. Long wearing eyeshadow pencils that highlights, provides intense luminous colour, precise lining and primes lids. Can be used to highlight facepoints such as cheekbones, tear ducts and brow arch. This kit contains 3 eyeshadow minis - Lilith (Champagne), Angel (Rose Gold), Gilt (Golden), a metal container with a mirror and a pencil sharpener. I love ALL three shades, Lilith is incredible to wear alone, as a base or to highlight. I usually use Angel and Gilt alone on my lids. The pencils are extremely smooth, easy to blend and use. The pigmentation is intense, the swatches above are one line swatches only. The wear time is approximately 8 hours, I wore this for 12 hours and noticed creasing to Lilith. This kit is perfect for travel! I love that the container comes with an in built mirror and includes a little sharpener, it's so handy and efficient!! I have a couple of holidays in mind for 2017, and I can't wait to bring some Nudestix with me! Have you tried these little gems? Let me know your thoughts in the comment below! My boyfriend and I have been together long enough... How long you ask? I'm not too sure, but it's long enough for me to feel completely comfortable not shaving my legs for two seasons and for him to still find me attractive. I tend to like growing my hair out during winter, especially the hair on my legs (and I assure you there's lots of it) to keep me warm during the cooler months. When summer hits, the winter layers will be removed to reveal baby smooth skin. In this post, I'd like to introduce some cool products you may or may not know is around by Gillette. Razors are seriously becoming more and more advanced. The little silver ball allows the razor to move from left to right, allowing shaving to be an easier experience. I couldn't go past this ergonomic little fellow without putting my work hat on, I felt that this little fellow would be amazing for anyone with limited ulnar and radial deviations or limitations in wrist movements. I've actually given this to my mum cos she has reduced right wrist movements and found this to be helpful. First of all, just look at that giant moisture bar! it's phenomenal and smells fruity/delicious, it literally smells like sugar and berry. This the most self sufficient, moisture intense product, my legs never felt so moisturised after a shave. The one and only downfall is when I don't shave for a few... or.. many months and some of my shaved off hair gets caught in the balm. I would recommend this for regular shavers. The one thing I absolutely love about this razor pack is that it comes with a shower holder!!! Gone are the times you don't know where to put your razor after a shave. I try to avoid packing razors when I travel, mainly because they are difficult to store, I don't know why but the lids always come off and it's just an awkward shape for my makeup bag. This product is the ULTIMATE travel razor, I can't believe how adorable it is andit comes in it's own little case. You can literally slip it anywhere! The heads are detachable and you can purchase re-fills in store. Super handy! 4 x more moisture formula to ensure there are no missed spots! This is the coolest shaving foam, its comes out with purple swirls, it look yummy haha! The foam is easy to apply and allows shaving to be super easy. I usually use soap or a cream, this is actually the first time I've tried using a foam and it makes a huge difference. My razor doesn't get clogged as frequently! Since I was a kid, my parents had always been "prepping" me to find a some what decent career pathway, however being anything but a high achiever I wanted to be that person who sold bus tickets on the bus. Throughout my high school years my heart was set on being an artist or a musician, however during my final year in high school, I had a sudden interest in psychology, why people behave the way they do and all the reasoning behind individualism and conformity. Social and Abnormal Psychology was a topic of interest. By miracle I got into a Bachelor of Psychology and soldiered through 4 years of uni and completed a degree that I no longer formally use. University is expensive, 4 years of your life is a long time. I am hoping that this post will provide information to those who are looking to do a psych degree and to rececive all the information before you reach your 4th year. I had a lot of negative experiences from my degree, but will try and keep it civil and balanced! When I did my degree, the University Admission Index was a lot lower for B. Arts (psych). While the kids in B.A (psych) will not have received as much exposure in terms of different psychology units as you would in B. Psych, but you can still become a psychologist. My psych degree consisted of a mixture of psych units (Abnormal, social, environment psych), Biology (neuroscience, genetics etc), logical thinking/psych theories and a LOT OF STATISTICS. A lot of B.A (psych) kids were able to transfer across to B. Psych given they reached the minimum GPA. Throughout my 4 years, I was taught to think logically, rationally and how to make an educated guess. Essentially, a step by step guide to become a researcher following the scientific model. Throughout the entire degree, at no point was I or any of my classmates was ever exposed to any elements on how to actually be a psychologist (a part from rote learning diagnoses/treatments from the DSM). At no point was I taught how to engage with a client, how to make the correct recommendation or anything related to how to become a practicing psychologist. No work experience is provided in the 4 year undergrad degree. The 4th year is the research year, you more or less spend the entire year writing your thesis, conducting experiment, gathering your data and analysing your stats. The fourth year is a pathway to further education, again builds up your skills to be a researcher, NOT a psychologist. At the end of my fourth year, I was able to apply for my Provisional Psychologist Registration, but don't be fooled, my knowledge on how to be a practicing psych is as good as those who haven't studied psych I was able to tell you why and how things happen, but I did not have a clue as to how to provide Psychological interventions. At the end of the 4th year, we were told that our job options were limited - I will elaborate on this below. - Masters: This can be in Clinical or Organisational Psychology etc. both are extremely competitive, unless you obtain a fantastic GPA in your 4th year with a great proposal and recommendation by a lecturer, it may be difficult to get in. When I was studying, each course took 4-6 students per masters degree. Clinical Psychologists are generally highly regarded and recognised, their pay is also significantly higher. Alternatively you can study at ACAP (but they don't provide HECS, only FEE-HELP I believe, and there is an entry requirement of applicants to have graduated with Honours class 2 - HOWEVER, having said that I knew people who have got into this course without doing Honours and completed a Post-Grad-Dip with Distinction Average instead). - PHD: This is a great option if research is your forte . Again, a very competitive path and a long and in-depth thesis. Most people who have graduated from their psych degree would have ended up taking this option. Why? Because this is possibly the only option to become a Psychologist without looking at grades, you'll only need 3 things, MONEY, TIME, and COMMITMENT. This is not an easy path, because you have to find your own supervisors and pay them (can cost up to 20k p/a I believe?). You will be expected to find your own "work experiences" yes, more than one. A lot of companies cash in on this and require new grads to PAY for work experience. However, there are paid employment that can be accounted for as hours towards your work experience. At the end of your work experience, you will be able to complete your full psych registration, however you will be a General Psychologist. As foramentioned, pay is significantly less than a clinical psych. Also keep in mind that there are a lot of General Psychologists around. This is for those who decide not to pursue further education after your psych degree. The good news is, your degree is highly adaptable, it's a great sales pitch, you can shape and mould your knowledge to fit a lot of different jobs. Two months after I graduated, I winged my way through to the final round of interviews as a Point of Entry Officer for Immigration paying up to 80k p/a, which was a lot for a 22 year old with no experience - FYI, I did not know a thing about policy/legislations/immigration. Unforutnately I fell short (which was expected), I did not get this job and kept applying, I got an interview as an employment consultant paying 45k, and later a Psych clinic admin that offered a measly hourly rate. I had an extremely difficult time finding a job. The bad news is, your skill set is so broad that you won't be able to ease your way into a specialised profession. You'd be like jack of all trades. Unless you have the gift of the gab, you may find yourself either pursuing further eduation or studying something different altogether. All in all, a psych degree is not a 4 year commitment, it's a 6+ year committement. So I gave myself 3 months to find a job - I had my eggs in the point of entry role and was ready to be deployed to wherever they wanted me to go. Unfortunately, I was young and grossly inexperienced. It didn't take a lot for me to change my career path, I found a few Masters degrees I can get into, went on seek and typed in the different positions and picked the degree with the most job searches on seek. Logical huh? I am now a full time Occupational Therapist, some times I like what I do, other times I don't and occasionally I'd look back on my Psych degree as if it's a long lost best friend whom I no longer see. One thing I know for sure is that I can never see myself as a conventional practicing Psychologist. Sometimes it takes 4 years to figure out something is not right for you, my psych degree was invaluable in a way that it acted as a very expensive self-help guidance/4 years of intensive treatment for my own mental wellbeing. Did you know that a big portion of the product we put on our skin gets absorbed into our blood streams? All the talc in your eyeshadows, parabens in your foundations and mineral oil in your creams. When I attended Lee Holmes' Earth Mask launch, it made me realise the amount of chemicals I put onto my skin... It's concerning isn't it? Lee Holmes created Earth Mask and Scrub that features a combination of minerals from the earth to your skin. This product contains two ingredients only, Food-grade diatomaceous earth (USA) and Lightning Ridge Volcamin (Australia). Volcamin is a kaolinate sourced exclusively from the outback of Lightning Ridge, a town located in NSW, close to the border of QLD. Lightning Ridge is a world renowned centre for black opals and other opal gemstones. As an Occupational Therapist, Lightning Ridge is probably the most interesting and challenging place to work in terms of home modifications, as a substantial amount of houses are heritage listed, there are also underground residential. Volcamin is high in negative ions, which attract positively charged pollution, dirt and bacteria from your skin. This product is your key to clear and beautiful skin as the healing and enriching minerals are both rich in silica, this product can be used as a face mask OR an exfoliating scrub. Earth Mask and Scrub is great for age spots, pigmentation and rosacea. This 2 in 1 pot of goodness can be used as a mask by adding 1 tbsp of Earth Mask and Scrub onto the palm of your hand with water. Can be used weekly. As a scrub, work into a paste and apply in circular motions avoiding the eye area. Can be used up to 2-3 times per week. I like to massage the mask onto my face to exfoliate then leaving it on as a mask. Above is a photo of Earth Mask and Scrub being demonstrated at the event, and below is what Earth Mask and Scrub looks like on my skin. My skin felt tight and radiant after application. It's so good to know that there are only two ingredients in this product and no nasties going into my body. As always, wrapping up with food, we were treated to the tastiest organic breakfast I have ever had!! If you are interested in getting your hands on Supercharged Food Earth Mask and Scrub, it's available for $19.95 here. Do you body and skin a favour! I can't believe we hit 37 degrees this week and fluctuated down to 17 degrees today. This weather is too temperamental. I heard that it's gonna be a hot one this summer. As much as I love summer, I hate makeup melting off my face, I also become increasingly lazy and slow since we don't have air-conditioning at home. So the less products on my face the better... the less steps the easier! Although I must admit that I can only occasionally pull off this look on a good skin, puffy under eye bag-free days in order to be photographed. Anywho, I bring you my lazy girl everyay look with Clinique's Chubby Sticks. I used Shiseido's Stick Foundation in O40 as this is the only stick foundation I own, but also my ultimate go to when I need something quick. For this look, I used Fasio stick concealer, I picked this up while I was in Japan and was impressed by it's concealing abilities! For eyes I applied a light coat of Clinique Chubby Stick Shadow Tint in Lots o' Latte*, this shadow stick is one of the most comfortable and long wearing. I took this on my cruise and would wear it for up to 12 hours at a time. If you are looking for a deeper colour, try Clinique Chubby Stick Shadow Tint in Fuller Fudge. 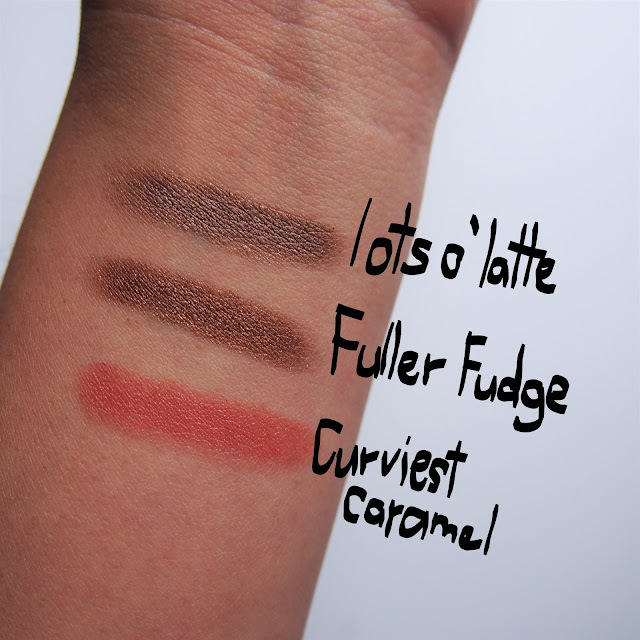 I doubled up Lots o' Latte as a contour stick, it provided a very natural and subtle contour. Very easy to blend. Clinique Chubby Intense Moisturising Lip Colour Balm in Curviest Caramel* was used as a 2in1 product as well. As per it's title, this chubby stick is very moisturising on the lips while creating a beautiful natural flush on the apples on the cheeks. I love this balm, it seems to be fragrance free, very moisturising, soft, smooth and light weight on my lips. When you work sometime in the morning till whenever in the evening, time is of essence. When I come home from work, I like to take my time with my skincare routine (which consists of a billion steps), it's a different story in the morning as I only have 50minutes to 1 hour from the point I get out of bed to the train station. If I break everything down, I'm essentially left with 5-8 minutes to put on my skincare and makeup. Due to a lack of time, my morning (weekday) skincare routine consists of sunscreen only. Awful, right!? Lately, I have been reaching for a new product, Cinch... and you'll find out why below! Vegan, cruelty free and free from preservatives, parabens and synthetic fragrances. Contains Superox-C extracted from Australia's Kakadu Plum which contains the world's highest concentration of Vitamin C.
Can be used under makeup, over make up or on it's own. I have been reaching for Cinch almost every morning, it takes no time to apply and kudos to the awesome spray nozzle, it covers my entire face in 2 sprays. During the day time, I would still apply sunscreen on top of Cinch as it does not contain SPF. The content is like a luminous milky fluid, I like to pat everything in with my fingers and the product is absorbed within seconds. My face would feel soft, smooth and supple. I was actually glowing, my lips were glowing. There is no shimmer... just magical illumination. My face did feel moisturised, although if you have patches of dryness you might want to double up on the spray or add some heavy duty cream (I have a healing dry patch on my nose which requires special attention). This product would work wonders for those with combination skin, even though it illuminates your face it's not oily. I haven't noticed any changes to my pore size - I have a lot of pores... a lottt and they are quite big, I personally feel that no product in the world will be able to reduce the size of my pores. Within seconds, my morning skincare routine went from just sunscreen to moisturiser, illuminator and primer in ONE spray. I love clever, efficient and innovative products, the more in one the better. *This product was provided for editorial purpose, all opinions are my own. Christmas is creeping up on me and I am feeling the festivity. 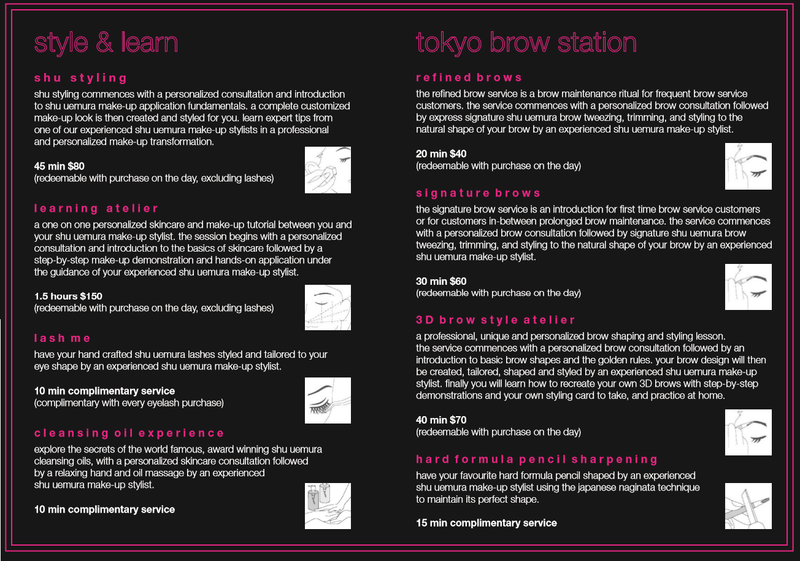 I was lucky to have recently been invited to attend a make-over at Shu Uemura's Boutique in the QVB. Lovely Liz asked me what kind of look I wanted to create... boy, I umm-ed and uhh-ed for a good minute. I wear a LOT of neutrals and initially wanted to opt for a neutral work-appropriate look. It wasn't long for me to throw that idea out the door and agreed to do an orange look with a dewy base. My makeover started off by removing the small amount of foundation I had on for the day with Shu Uemura's Cleansing Oil, and proceed with a full skincare routine using Shu Uemura's Tsuya Skincare range. The products were beautiful and smelt incredible. Shu Umeura's Cosmic Blossom Eye and Cheek Palette was selected for me. I was quite hesitant when I saw the bright orange eye shadow and it's earthy red neighbour. However once my applied I was stunned by how much I liked it, it was really quite natural and work-appropriate!!! I was so glad that this palette was selected for me because I would never consider trying this palette if I didn't get a little bit of encouragement. I am in love with Shu Uemura x Murakami range, apparently so is my boyfriend... he is a big fan of Murakami's art, so much that he forced me to give him the little Murakami signature flower attached on my Shu lash curler!! Below I have a couple of unedited and unfiltered full faced look, please excuse the cheesy smile. If you would like to get your beauty on this festive season, head over to Shu at David Jones or QVB! I've included their service menu above for your reference. This is especially good if you have a night out and wanted to get some shopping done at the same time! A MASSIVE thanks to Shu Uemura and SHAPR team for having me!! *Lily not Louise attended this makeup session as a guest of Shu Uemura. Boy, did this foundation receive a hoard of criticism. I've read the good, the bad, the inbetween and decided to put this to good use and provide my personal verdict. Before we start, I'll give you a break down of my skin profile. My skin is genernally dry, dehydrated but I can get an oily T-Zone... I'm not really sure what it makes me. My shade, according to MAC is NC25 or NC30 (during summer) - just for your reference. Now that's out of the way, let's get on with the review..
- Revolutionary quick-break texture that transforms whilst blending it on skin from a bouncy water-gel to a refreshing cream. - Lightweight, buildable coverage doesn’t clog pores and lets skin breathe. - Natural Mineral Powders help absorb excess oil, leaving skin shine-free all day. - Aloe, Chamomile and Sea Algae Extracts help to reduce the appearance of redness and even-out skin tone. - The product comes in a pot with a white protecting cover, this cover is great in a sense that it prevents the foundation from staining the lid.. and the same time I dislike it because the product goes all over the cover. It's not the most travel friendly foundation. I'm clumsy and I've dropped it a couple of times - it gets messy. I personally prefer a press pump or squeezy bottle. - Product texture is light weight and spreads very easily. I generally don't have oily skin so I can't comment on whether the product absorbs oil or not. - The foundation is best applied with a dense flat-top or rounded brush (I've seen a few people recommend a sponge, but I've never actually used a sponge to apply my foundation so I can't comment!). Avoid flat foundation brushes as it will cause streaking. I find the shade to change when applied with my fingers. Perhaps it's the warmth of my finger tips? Although, I did not experience any blotchiness with either shades, but I can see how the warmer shades might subject to blotchiness. - My pores were still visible, however with one layer of foundation my smaller imperfections were reduced (although still visible) as well as redness around my nose. The product does not feel heavy on my face and my skin looks natural! After a few hours of wear, some of the foundation slipped off my nose - which is not unusual for me. - With two layers, upon application it's fine. After a few hours I saw a lot of cracks and lines as if my skin was awfully dry, this was particularly visible between my brows, on and around my nose and mouth. - I have been wearing this foundation most days for 3 weeks now, with one layer, it is light weight, wearable and I'm happy with the result. This foundation does not have the best wear time. I would not recommend this if you are looking for heavy coverage or a foundation to layer. I wasn't sure what to expect when I was first approached by Michelle from Lilac and Berries. I've tried a range of Japanese skincare, but the entire Korean skincare routine was new to me. After attending Bobbi Brown's Masterclass, I am now willing to spend time on my skincare to ensure my skin is at the best state possible. The better my skin looks, the less foundation I need and the better my foundation looks on my skin. I had the utmost pleasure of trialing a carefully curated range of Korean Skincare (curated by Michelle from Lilac and Berries) tailored for my skin. My skin is temperamental, it ranges from combination to dry. However, for the past few weeks, I have been testing the "Combination" range. The result has been phenomenal. If you have been following my blog for a while you would've seen my skin at it's worst (see my Thin Lizzy post). My skin has cleared up a LOT (just see the video), a lot of the credit goes to double cleansing and the other goes to proper moisturisation. The entire 10 step Korean Skincare Routine is overwhelming, so let's break it down and go through the first 4 steps! The first step of the Korean skincare routine is removing your makeup - this should be in your routine regardless! For this step, I am using Heimish All Clean Balm, this balm transfers from solid to oil upon contact with you skin. This oil based cleanser will dissolve all traces of makeup on your face whilst leaving your skin feeling fully moisturised. This is hands down the BEST makeup removing balm I have ever use. Unlike the other cleansing balms, you will be able to wash everything off under lukewarm water you won't need a cotton cloth. If you have used cleansing balms you will know how difficult they are to remove! I packed this product onto the cruise with me because I was terrified that I'd break out from not cleaning my face properly. It's gentle and removes everything - no more clogged pores yay! I have read many positive reviews on this product and let me tell you, it's worth the hype. Heimish All Clean Balm (120ml) is available for purchase from Lilac and Berries for $30AUD. If you are not double cleansing then you need to get onto it. My breakout rate dropped ever since I started to double cleanse. Prior to double cleansing, I use to expect my cleanser to remove my foundation, blush, bronzer, powder, highlighter AND properly clean my pores. So it makes sense that my pores cannot be properly cleaned with make-up in the way! For this step I used Neogen Real Fresh Foam Cleanser (Cereal), a unique cleanser that contains rice seeds and rice seeds extract, formulated to brighten and hydrate skin. This water-based foam cleanser is extremely creamy, a full pump is more than enough for your entire face. A very hydrating and gentle cleanser that is perfect for those with combination or dry skin. Neogen Real Fresh Foam Cleanser (Cereal) is available for purchase via Lilac and Berries for $29. Exfoliation is certainly not recommended for daily use. As most of us are aware, exfoliation will remove dead skin cells, clean out your pores and unveiling brighter skin. For this step, I used Neogen Bio-Peel Gauze Peeling (Green Tea), I like to call this an "inbetween" exfoliant because it harness the uses of both manual and chemical exfoliants. Each pot contains 30 single-use pads, the pads contain lactic acid which penetrates the skin to clean your pores. I like to use the gauze side to exfoliate all the dead skin and impurities, while using the smoother side to pick up all the dead skin cells. Following use, I would wash my face with lukewarm water. My skin feels squeaky skin after this step, this is perfect for people with dehydrated skin and recommended to avoid manual exfoliators - simply wipe your skin with the smoother side of the pad, leave for 5-10 minutes, wipe again and rinse. The fourth step is as important as the first 3 steps, toners are used to prepare the skin so that serums and creams are better absorbed. For this step I used Benton Aloe BHA Skin Toner. This toner contains soothing properties such as Aloe, Salicylic Acid for troubled skin and snail mucin to help natural cell regeneration. The viscosity of this toner is slightly higher than your conventional toners - following use, my skin felt soft and moisturised. You can pump this directly onto your palm or apply with a cotton pad. Although this is not a part of the steps, I had to include this product in this post. I kid you not, I have been telling every third person I have met about this product. I get dark circles and very puffy under eyes, so I use under eye patches to assist with de-puff quite regularly. I was previously using a different brand, they were selling 6 sets of patches (that's 12 individual patches) for $32. I am SO HAPPY that Michelle from Lilac and Berries had sent me this little miracle, a whooping 60 individual patches, that's 30 sets for only $28!!!!!!!!!!!!!!!!!!!!!!!!!!!!!!!!!! And the result you asked? It works exactly the same as my expensive patches. I will never ever want to pay more than $28 for my eye patches! For free shipping, enter "lilynotlouise" on orders $55 or more to receive free shipping within Australia! Pssssst - A huge amount of products are currently on sale on Liliac and Berries! If you would like to start your Korean Skincare routine or just want to add a few Korean skincare products into your collection, Liliac and Berries is the place to start for top notch affordable products. I was shockingly surprised by how well the products worked on my skin. Despite this being a sponsored post, I will 110% be purchasing from Lilac and Berries.